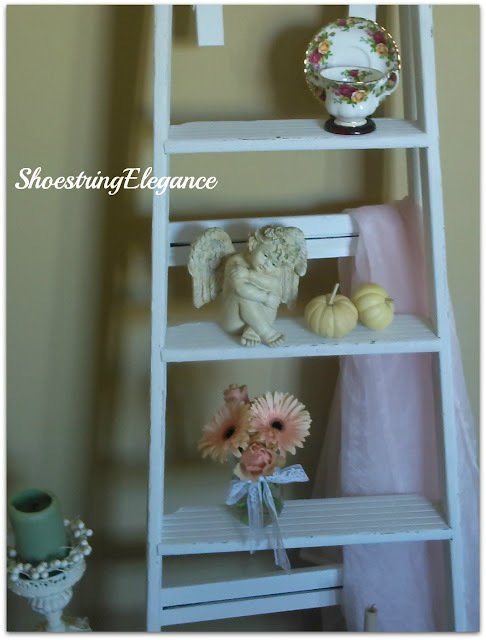 Shoestring Elegance: Ladder Display-Done with Chalk Paint, Of course! Ladder Display-Done with Chalk Paint, Of course! Have you ever seen something that you knew someday, somehow you would make or get one like it?! Kinda a crazy question, I know. But, I'm going somewhere with this. 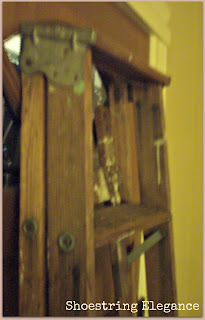 About a year or so ago I saw this beautiful white washed library ladder in someone's home, and, while I really didn't want exactly that one, I remember thinking, white ladder cool!! Which leads me to my latest project (And, I think one of my absolute favorites!) A couple of months ago, I was driving to my Mum and Dad's to do some watering for them, while on my way, I passed a yard sale. Did I say passed, yeah no...I stopped at a yard sale! (I swear I should have one of those "I brake for yard sales" stickers in the back window of my car.) LOL. So, now I was ready to make my dreams of what I thought this could be into a reality!! I brought it home, cleaned it up, and I mean cleaned it up!! Cobwebs, dirt, etc.. But once I was satisfied that it was clear of any debris, I got out my good old chalk paint and went to town!! Can I just tell you, if you have never painted a ladder, they take a Loooonnngggggg time to completely cover. Upside down, laying on each side, upright...Well, you get the picture. Ughh!! A little sanding and distressing where normal wear would have occurred and then just a matter of deciding what I wanted to display on it and where! I have probably changed out the things I put on the shelves, (I mean steps) at least five times now. But,I can sincerely tell you that I am completely in love with it now and find myself drawn to it more than anything else in my house . And, Yes!! It is in my living room and everyone that has seen it loves it and wants one, too!!! hoped you enjoyed my labor of love" as much as I enjoyed sharing it with you. Richella@Imparting Grace: Courtney@Feathered Nest Friday; Yvonne @Stone Gable's Tutorials Tips and Tidbits; Katie @ Katherines's Corner's Thursday Favorite Things Cindy @ My Romantic Home's Show and Tell Friday ; Debra @ The Common Ground's "Be Inspired" Sherry @ The Charm of Home's "Home Sweet Home" Kerryanne @Shabbilicious Friday at The Shabby Art Boutique Dana @ This Silly Girl's Life's "Lovely Ladies Linky Evelyn's My Turn For Us: Freedom Fridays Nici @ Posed Perfection's "All Things Thursday Blog Hop" Wendy@ The Shabby Nest's Frugal Friday Karen @ Redoux Interiors Friday Party Becca @ DIY Vintage: Chic Friday Fives Heather @ Stringtown Home's "Tips and Tricks" Angie @ Little Inspiration's Create & Inspire Friday Party Jen @ Tatertots & Jello Bevery@ How Sweet the Sound's Pink Saturday Vanessa @ Nifty Thrifty Sunday Susan @ Between Naps On the Porch's "Metamorphosis Monday"
This is such a great idea, I LOVE LADDERS!! Thanks Brooke, I Love them, too!! I'm, popping over to your party now. Thanks! 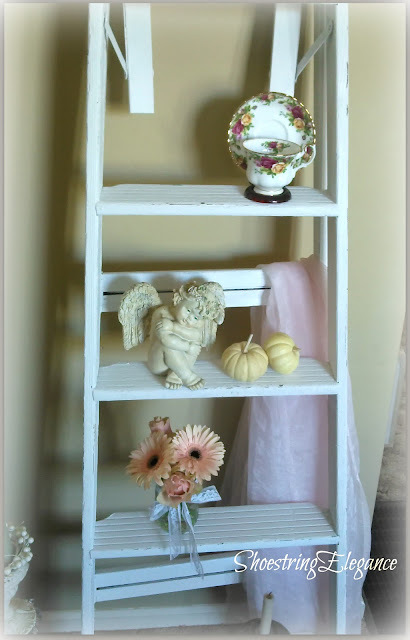 I have seriously always wanted a ladder display (i have a bunch pinned on my Pinterest boards) since, just like you show, they are so versatile, and cute and funky. I love what you did with it! Hi, Kim! Thanks so much for taking the time to leave me your lovely comment!! 'm glad mine didn't disappoint. I will have to check out your Pinterest pages!! L O V E your ladder. 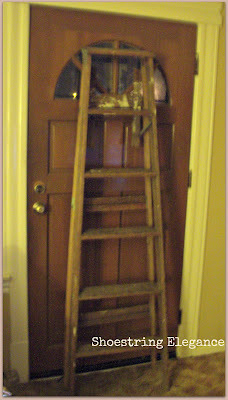 I looked and looked for a ladder and finally found one in the summer. I didn't really paint it, just slapped a little ASCP on in antibes green. I have mine in my garden because there is no space in the house. This is my first visit to your blog, but I will be back to check out your other projects. When I read your first sentence I said 'YES'!! I do that all the time :). I have a cute little ladder in a guest bath that I use for towels, but I love yours! Great job Theresa, and as always, thanks for stopping by today! 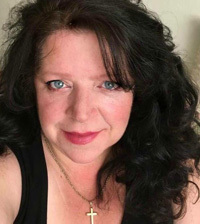 Thanks so much, Doreen!! I really appreciate the kind comment!! I love the way the ladder looks . 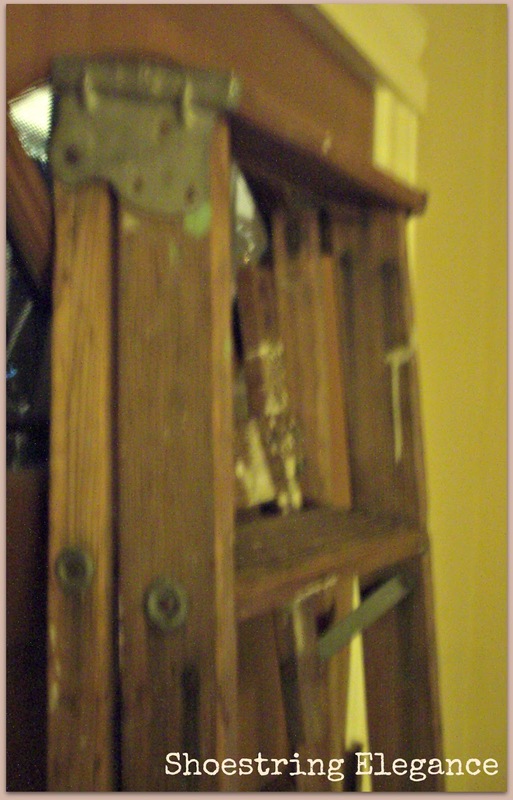 I threw away a large wooden ladder yearsago, I always have hated myself for that!!! Coming by from Bloglovin' following you on google+ . I would love if you could visit me. HI Kim, Oh no!! I could never throw away a latter now!! At least not a wood one. :( Popping over to see your Blog!! This is a fantastic idea. 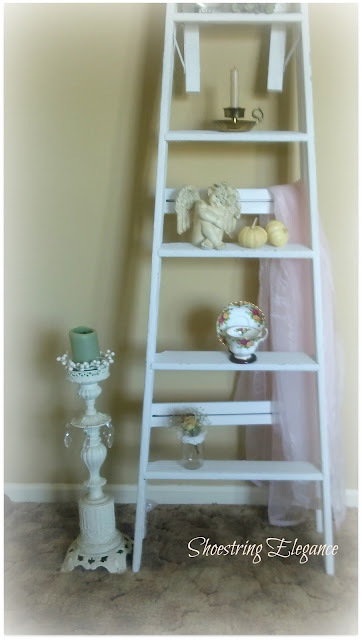 I have some old ladders around here and now I want to do this too! Lovely idea! Yeah, Jennifer!! I hope you do paint them! If you do, will you come back and let me see how your turned out or shoot me an email?!! Lots of fun to have!! Oh my! Who would ever think an old rickety ladder could become so elegant! Looks wonderful now and isn't it the happiest moment when we find what we want and it didn't break the bank! You did good!! Yes, Jill, It is the happiest moment!! And your right, I bet I didn't spend more than 5 BUCKS ON THIS ONE!! Love That!! Thanks so much, Heather!! So glad you liked it!! It was a good weekend. I pray the same for you, friend!!! 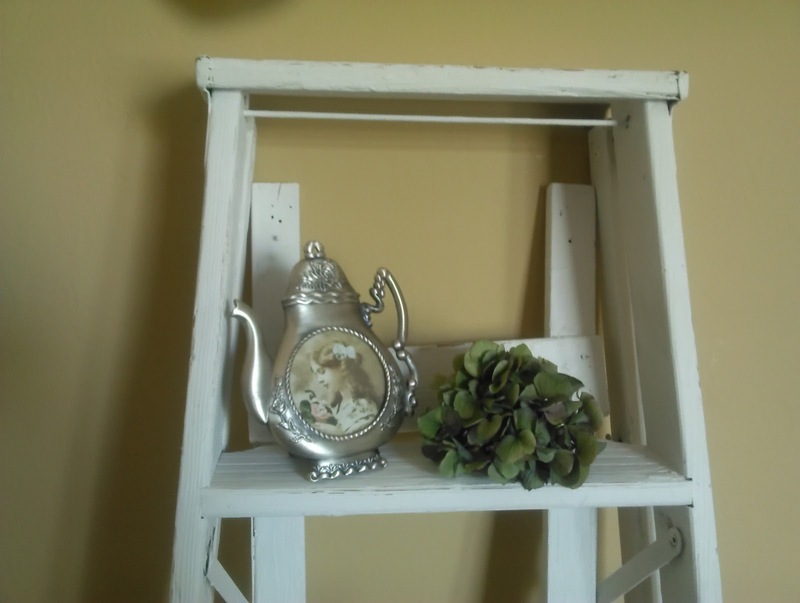 I think ladder displays always add more interest to a room. Great find Theresa... and a bargain too! I love your ladder, it looks great! I used a shorter one for my patio herb garden. 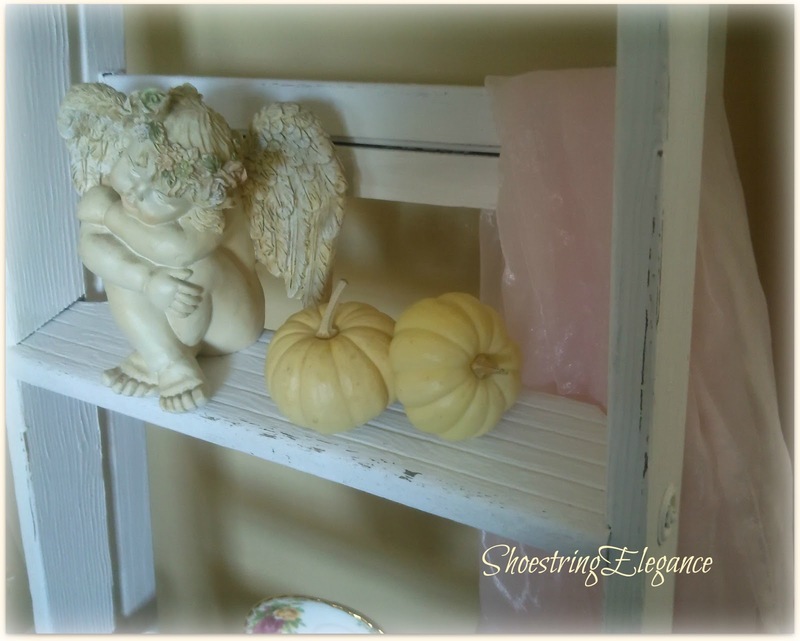 Isn't it fun to repurpose these old things that some people discard? Happy Thanksgiving! Yes, Linda, it is!! Thanks for coming by. I'd love to see your herb garden one!